LPe provided structural design for this hospital which will ultimately replace the existing facility currently in operation. The new structure consists of a 120,000 square foot, two story facility which is supported on shallow foundation and braced using Intermediate steel moment frames and concrete share walls. The floor structure consists of a composite steel deck and composite steel frame/girder. The building exterior has a brick façade and metal panel wall system. In addition, a single story EMS facility with a steel frame is included as part of the design. 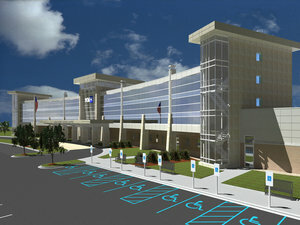 LPe provided structural engineering services for this three-story 60,000 square foot expansion of the existing hospital. The design includes a future vertical story expansion with composite steel frames with a combination of shear walls and ordinary moment frames. LPe provided structural engineering services for this single story 12,000 square foot steel frame Medical Office Building. The structure is laterally braced by a combination of X-braces and moment frames. LPe provided structural engineering services for this two three-story composite steel frame 30,000 square foot medical office building. 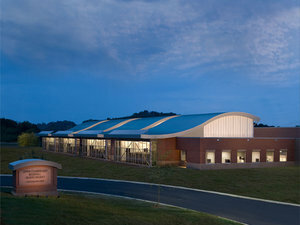 Structural engineering design services for this new 50,000 square foot healthcare facility.